As the days of second and final term dwindle down ("to a precious few," as an old song goes), President Bush is likely to leave office as the least popular president in polling history. Presidents usually benefit from at least a little pre-departure nostalgia when their successors are about to take office. At the beginning of Harry Truman's last year in office, he had only a 22 percent approval rating (a Gallup Poll low point). But Truman bounced back to 32 percent in December, a month before Dwight D. Eisenhower was inaugurated. Jimmy Carter's CBS News/New York Times Poll approval rating dropped to 25 percent in November, 1979. He left office in January 1981, having lost to Ronald Reagan by ten points. American hostages had been held in Iran for more than a year, and were finally released only as Carter was flying back home to Georgia. And yet, although the economy was still in terrible shape, a few days after Carter left office, Americans were equally divided in their assessment of his term: (44 percent approved and 44 percent disapproved of the way he had handled his job). Another recent one-term president, George H.W. Bush, lost his re-election bid, but by a smaller margin than Carter's. And he fared better than Carter with the public when he left office. Looking back, 54 percent of Americans approved of the way the first President Bush handled his job. Just six months before, in the recession of 1992 (and while he was running for re-election), his approval rating had been 23 points lower - 31 percent. Considering his entire four-year term, Americans could remember President Bush's high point: just after the successful conclusion of the Persian Gulf War, when his approval rating was 88 percent. Both of our two most recent two-term presidents - Ronald Reagan and Bill Clinton -- ended their eight years in office with high marks. Each had approval ratings of 68 percent when he left office. While neither reached the high level of support that the first President Bush had after the Persian Gulf War, neither ever fell as low in their eight years in office. The current President Bush matched and even bested his father's high approval ratings after the terrorist attacks of September 11, 2001. But the low overall assessments of the younger Bush have been extraordinary. Never in his entire second term did even half of Americans approve of the way he was handling his job, according to our CBS News Polls. Indeed, for the last year and a half, George W. Bush's approval rating has never risen above 30 percent -- a lower figure than every single rating CBS News measured for his father. The president's approval rating first fell below 40 percent after the administration's slow response to Hurricane Katrina in September 2005; it was barely above 40 percent the next January, but it would never again go that high. Why has this president's approval rating stayed so low for so long? There are other reasons besides Katrina. There's no doubt that as the war in Iraq dragged on, Americans became more and more distressed about how it was being carried out. In April 2003, 79 percent had approved. But by January 2004, fewer than half the public approved of how the President was handling the war in Iraq, and that number kept declining. The worsening economy, too, took a toll; and Americans tend to be especially harsh in their judgments when issues hit as close to home as economic issues do. Jimmy Carter's economic approval ratings were frequently in the teens (15 percent in mid-1979); George W. Bush's approval rating on the economy sank to 16 percent last September, and has not recovered much since then. Only at the start of his first term, and in the months following 9/11 did a majority of Americans approve of the way this president was handling the economy. The president's response to terrorism was his strong suit with the public - there was consistent majority approval through most of 2005. Subsequently, approval has only occasionally reached that level; and since 2007, majorities have expressed disapproval here, too. CBS News has been measuring presidential approval for almost 35 years; and Gallup, which first posed the question in public opinion polls, has been doing it twice as long, starting during Franklin Roosevelt's second term. Compared with the early days of both polls, there is much more partisanship today in how people answer poll questions. When Jimmy Carter hit his lowest approval rating (26 percent) in 1979, relatively few members of his own party were willing to say they approved, either. Carter's approval rating among Democrats was just 32 percent. Fewer Republicans approved of the Democratic President, but the party approval gap was only in the teens. But in our December, 2008 poll, there was a 50-point gap in the way Democrats and Republicans viewed President Bush. Fifty-seven percent of Republicans continued to approve of how George W. Bush was handling his job, while only seven percent of Democrats did! Even now, as Americans express optimism about the impending Obama presidency, and there is talk of "post-partisanship," a partisan chasm remains. CBS News will report one more approval measurement before President Bush leaves office. 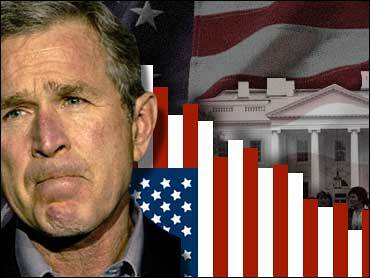 Right now, Americans remember the bad times more than the good times when they evaluate President Bush. But while we talk a post-partisan game, so far we are viewing the Obama presidency through partisan lenses. A gap of 56 points divides Democrats and Republicans on the question of what kind of President Americans expect Barack Obama to be. Eight-four percent of Democrats expect him to be a good or very good president; but just 28 percent of Republicans say the same.